We’ve all had moments while placing bets when we’ve hoped that the gods will be on our side. However, it is very rare that you get the chance to bet on a sport in which the gods are quite literally on your side. Here at Master Mazuma, we think Smite is a fascinating game with an epic concept which is a perfect fit for eSports. To explain just why we think it is so great, we have put together this introduction to the game and also a couple of pointers on what to consider when getting involved in Smite betting. 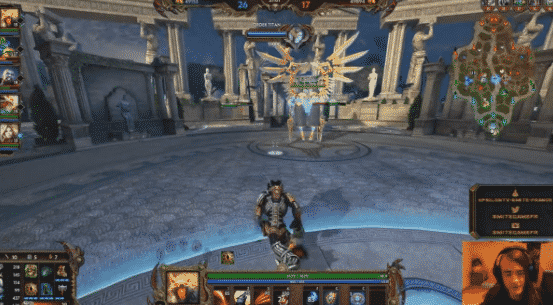 Available for Windows PC, PlayStation 4, Xbox One and macOS, Smite was originally released by developer Hi-Rez Studios in 2014. The game is a third-person MOBA, which for the uninitiated means “multiplayer online battle arena”. In Smite, players are called to control a god-like figure with origins from different mythologies and cultures across the world such as Egyptian, Greek, Celtic and Roman. Each of these “gods” is classified as Assassin, Guardian, Hunter, Mage or Warrior, with each class offering different skills as you do combat. For example, Assassins are strong at inflicting damage, while Mages – as you’d expect – specialise in magical abilities. Players are split into two teams of five. The main aim of the game is to destroy the other side’s Phoenix defences and finally a giant warrior known as a Titan. As you can tell, this game is epic, ambitious and truly thrilling. Of course, the online battle arena concept used in Smite makes it absolutely perfect for the world of eSports and there are a host of competitions and tournaments based on the game held across the globe. The biggest and best known is undoubtedly the Smite World Championship which, like many of the major tournaments held in eSports, is organised and arranged by the game’s developer, Georgia-based Hi-Rez Studios. The competition was first held in 2015 with a $2.6 million prize pool which was at the time one of the biggest in eSports. While a cap of $1 million was placed on the prize money following the inaugural event, Smite is still believed to be one of the most lucrative eSports to play and has a place at the table as one of the biggest names in competitive gaming. How do Smite tournaments work? One of the first key issues to consider when getting involved in Smite betting is how competitions and tournaments tend to work. While the formats can vary, we’ll take a look at the format of the PC-based Smite World Championships held earlier this year in Atlanta. The tournament involved ten teams, with eight starting off in a placement round which had a double elimination bracket and a best-of-one format. The best six sides then moved on to the Quarter Finals, where they were joined by the top seeded teams from North America and Europe who received a bye to join the competition at that stage. The Quarter Finals operated on a best-of-three basis, with the subsequent Semi Finals and Final following a best-of-five format. So you now know how the game’s biggest tournament works and the basics of this action-packed game. But what should you bear in mind when taking your first steps in the world of Smite betting? It always helps to familiarise yourself with some of the common names you will come across while following the eSport, from teams to the best-known players. In terms of sides, NRG eSports won this year’s World Championships and earned a $600,000 prize pot in the process. Beaten finalists Obey Alliance are another to look out for, along with the likes of Luminosity Gaming and Team Eager. Well-known competitors in Smite competitive gaming include US player Andrew Woodward, who is known as “Andinster” and is thought to be among the biggest earners from Smite competitions in recent years. He was recently part of the Soar Gaming side which took part in the 2017 World Championships. Another name to watch out for is “BaRRaCCuDDa”, US player John Salter, who was part of the Luminosity Gaming side mentioned earlier. Of course, while you need to know the most famous names to look out for when Smite betting, they should not be your only focus. Keep an eye out for new talent as it emerges in the different sides, as betting on up and coming players with an outside chance of success may well mean winning big thanks to longer odds. As well as watching tournaments, you can monitor the performance of teams and players in a host of different ways. Undertake a little bit of research on each side to study their lineups and generally how they compare to those they are coming up against. Investing a little bit of time in this analysis could be very useful in offering vital betting information.